Samsung provides a wide range of office automation solutions for all business types and sizes, ensuring that all your unique needs and requirements are met with the greatest value offerings on the market. Education Industry – Schools, tertiary institutions, etc. Healthcare – Clinics, hospitals, dental, etc. It’s easy to register your printer directly with Google’s servers, and because you’re connected to the web, drivers and firmware can stay up to date without demanding your attention. Shared access by simply sending them a link to the device, with monitoring and privacy options for shared rights and restrictions. 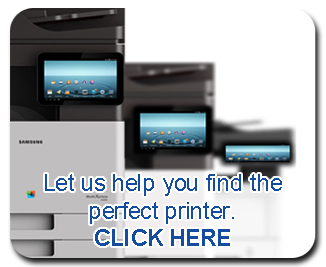 Printing from various Samsung devices makes printing from various locations and digital formats easy, improving workflow processes and time management. 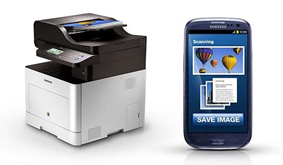 Samsung MobilePrint features a robust set of print options, bringing users incredible flexibility by enabling them to adjust settings including the number of copies, paper size and orientation. Documents are kept private by using secure transmission protocols, as after a Cloud Print job is completed, the associated temporary print file is deleted from Google’s servers. You can also delete print jobs and their history, from the Google Cloud Print management page. Also, this reduces printing costs by identifying unclaimed print jobs. Automatically distributes scanned documents to multiple predetermined destinations to reduce manual and repetitive document work. Prints from, and scans to, various cloud services by using a variety of file formats, saving users valuable time. Controls and reduces printing expenses by easily and intuitively tracking all of the device usage. Sends custom configurable email notifications for remote proactive monitoring. 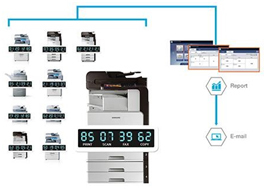 With the Usage Tracker tool, easily track printing and copying counts and cost, as well as scanning and faxing counts without a server. Conveniently utilize the touch screen user-interface of a compatible device for intuitive right-away tracking of one or multiple devices integrated in the network environment. 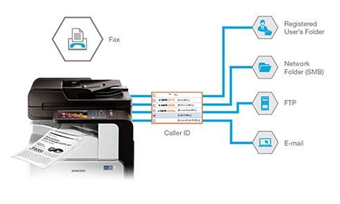 Automatically distribute faxes to predetermined locations by manually categorizing locations using metadata or caller ID. For example, incoming faxes can be automatically categorized by using the caller ID. This feature is a time-saver when all faxes received from a specific client need to be sent to one individual or a specific group. 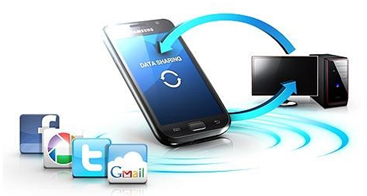 Cloud Connector can accept PDF, TIFF, and XPS scans and can print PDF and Google® Drive formats. With the ability to support various file formats and services including Microsoft® Sharepoint® Online and Google® Drive, Cloud Connector allows users to achieve the most efficient and convenient experience possible. Secure Login Manager supports a variety of authentication types, including ID/PW, proximity card* and Personal Identification Number (PIN). The optimal access method can then be chosen based on the situation and preference of each SMB. Equipped with secure pull printing, SecuThru Lite 2 ensures only authorized users can pull documents from up to 10 compatible devices connected to the network. 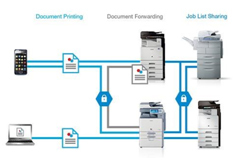 Safely and conveniently allows sharing of print jobs while protecting confidential documents. Delivers print jobs securely, only to authorized users, through a flexible authentication process supporting up to 500 users.